ART at the CENTRE of a responsible social transformation, this year at its 19th edition, is a festival of exhibitions, meetings and seminars narrating the artistic practices of transformation of the contexts in which they develop, realized by Cittadellarte and by the international network of subjects it has consolidated over the years. Art at the Centre represents the structure Cittadellarte’s visitors encounter for a whole year. It can be experienced in first person in forms and ways variable in intensity which give visitors the opportunity to practice an involvement offered by Cittadellarte as an open community in a constant process of research and practical experimentation. These opportunities range from short guided tours aimed at a first contact with Cittadellarte, its spaces and its activities, to short stays to get to know and directly and practically experimenting the programmes of the Terme Culturali, to the participation in UNIDEE – University of Ideas, a school articulated in weekly residential modules which can be combined into a multi-year course of studies in Art and Social Sciences. The modalities of living Cittadellarte and the festival Art at the Centre stretch to include the possibility of bringing one’s own activity into the heart of the Fondazione Pistoletto through forms of coworking and, for whom wants to maintain a strong connection even from afar, of operating in one’s own territory as Ambassadors of Cittadellarte and the Third Paradise. The first block of activities and projects concentrates on the theme of Education, of the artist’s residency as a formative path interacting with the context. The exhibition by Leone Contini originates from a process defined Connective Residency, conceived by Cittadellarte as a device to create connections among artists invited through the structural and long term projects which Cittadellarte develops with its territorial partners (in this case the project Let Eat Bi, started by Cittadellarte together with a close network of partners like associations, cooperatives, social enterprises and territorial communities, which aims at combining farming, culture and conviviality). The exhibition curated by Silvia Franceschini carries on a research on artist’s residencies as enzymes of social transformation, since 2000 a permanent laboratory in Cittadellarte. The third element of this block is the exhibition 500per1000, displaying works realized in the course of residencies at Cittadellarte. 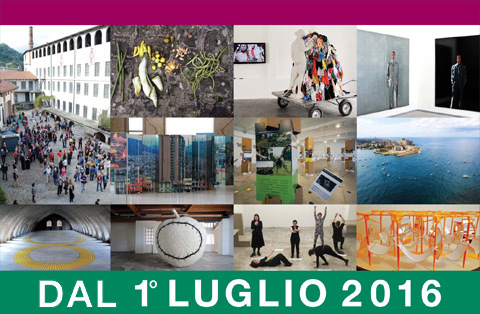 A second block of activities and exhibitions is dedicated to the “Geographies of Change”, the complex network of subjects active in the practice of a commitment for a social change which Cittadellarte weaves, or to which it is connected, both at a local and global level. This section is enriched by an exhibition realized for the United Nations, composed of projects and artistic initiatives developing innovative and sustainable planning models in cities or in rural territories. A third section is dedicated to the new role of Cittadellarte as Terme Culturali, where the muscles of creativity and sustainability are exercised through cultural treatments. In particular, this edition of Art at the Centre launches the Amacarium device and, for the first time assembled in a single exhibition, Michelangelo Pistoletto’s works “Before the mirror”. Pistoletto’s Reintegrated Aplle and ten scientific projects to recreate the integrity of nature. Public Art and urban transformation: what human and administrative instruments? Performance AMACARIUM. Readings and music. Curated by the platform Cittadellarte Fashion B.E.S.T. The Minimum Prize is a prize placed at the minimum level compared to the ones destined to big personalities who have dedicated their lives to the peace or the civil progress cause. The Minimum Prize wants to be at the basis of the research, the incentive and the motive of a process aiming at the values of new civilization perspectives as an objective. It is a starting rather than an achievement award. It is an acknowledgement celebrating who promotes a responsible social transformation. It is meant as a primary relationship among people producing a big change in human civilization through the interaction of single units. Minimum like an embryo, like a principle generating a new society, like an access key to an evolutionary stage where creativity and human science find ways to live with the intelligence of nature. This year at the 11th edition, the prize is awarded to El Puente_lab and Juan E. Sandoval. El Puente_lab is a laboratory of cultural activation, a platform for artistic production operating in Medellin (Colombia), whose objective is to create communication bridges between art and the inhabitants, to face together the concrete problems they experience in everyday life. The projects developed use artistic creation as an instrument to activate cultural dynamics contributing to education through a direct participation, to communication through sharing and to a conscious responsibility of the processes of urban and social transformation. El Puente_lab is formed by artists who have participated in the residency programme UNIDEE – University of Ideas and was founded by Juan E. Sandoval, artist and director of Cittadellarte’s Art Office. El Puente_lab, starting from its name meaning connection and conjunction, fully responds to the spirit proper of the principle of Trinamics: the art of creating an interaction between two different, even opposite, elements generating a third original phenomenon, which results from a harmonic, yet dynamic and energetically vibrant, balance between the two initial elements. The exhibition Porte - Uffizi, opening on 1st July, is set up in one of the most suggestive and special spaces in Cittadellarte: the former drying area in the attic. The work on display is articulated in frames of rooms and wooden doors showing the names of the different Cittadellarte’s Offices. Each Office carries out its own activity concerning a specific area of the social system and they all aim at triggering an ethical and sustainable change, acting both on a global and local scales. The path leading to the origin of Porte - Uffizi starts in 1995, when the exhibition Le porte di Palazzo Fabroni, curated by Bruno Corà and Michelangelo Pistoletto; In 1997, the Luigi Pecci Museum in Prato hosted the exhibition Habitus, Abito, Abitare. Progetto Arte. This experience led to the exhibition Porte - Uffizi, realized for the first time in 2003 at the MuKHA in Antwerp and subsequently installed on the island of San Servolo in the context of the 2005 Venice Biennale. In that occasion the writings on the doors put in relationship different artistic, economic and political disciplines. The Offices currently active in Cittadellarte are Art, Education, Ecology, Economics, Politics, Spirituality, Production, Work, Communication, Architecture, Fashion and Nourishment, and the new setup of the exhibition will include doors which, thanks to double faced writings, interconnect the different rooms. 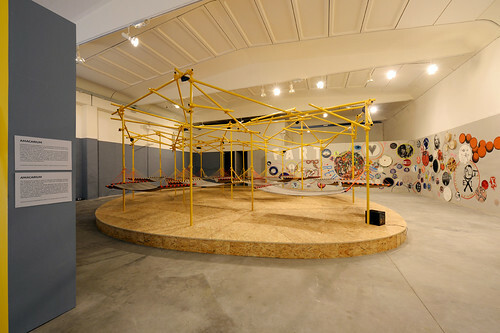 The visitor can therefore walk across a spatial representation of the philosophy of Cittadellarte, which in the last 18 years has been operatively bringing the artistic intervention into every sector of civil society, with the aim of contributing in responsibly and effectively directing the profound and momentous changes in progress. 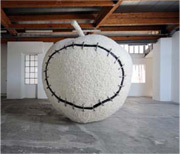 Pistoletto's Reintegrated Apple and ten scientific projects to recreate the integrity of nature. The exhibition Selvatica Scientifica, in Cittadellarte running till the end of the year, centred around sustainability and Pistoletto’s work “The Reintegrated Apple”, dialogues with both the themes of education and awareness raising, and with the Terme Culturali, offering itself as a “cultural treatment” to elaborate a vision of the world in which science assumes a leading role in the reintegration of nature. In 2015, Cittadellarte launched an innovative initiative in the context of the fruition of culture: the Terme Culturali. Cittadellarte’s whole structure has become a place dedicated to the care and development of the sensibility that art and culture reactivate and reinvigorate. The Terme Culturali are a space where to take care of one’s own mind and primary creative power; “creating is human”, has synthetized Michelangelo Pistoletto. Through the Terme Culturali, Cittadellarte offers visitors a space where to massage and warm up the muscles of creativity and this way reactivate one’s own creative dimension, through which to express one’s autonomy and to rediscover the deep roots of responsibility for what one thinks and therefore does. With a self-portrait Pistoletto began his exhibition career, in 1955, at the Circolo degli Artisti in Turin, where his father had been accustomed to present his works. Between 1956 and 1958 Michelangelo painted large-scale self-portraits in a thick, abstract idiom. In these paintings the face occupied the entire surface of the canvas. In this period Pistoletto rents an attic in via Bava in Turin to paint and to study contemporary artists, focusing on his need to find a personal answer to existential questions he sees expressed in the different artistic trends. In 1957 he made two self-portraits, Priest and Saint, large works in which the canvas was no longer filled by the face, but also bore references to Christian iconography. The exhibition intends to narrate, through photographic installations, the projects realized by the Embassies of the Third Paradise in the last twelve months. The Ambassadors have been able to create opportunities for citizens and local communities to get involved in the interventions carried out in the “jurisdictions” of each Embassy in order to raise awareness about themes like the respect for the environment, energy sustainability and a correct use of resources. From 1st July 2016 the exhibition Geographies of Change is enriched by the narration of a path carried out in the Biellese itself: Biellese in Transizione and Italia Che Cambia’s journey in the geography of change. The transition is a cultural movement engaged in ferrying our industrialized society out of the current economic model deeply based on a vast availability of low cost oil and on the logics of consumption of the resources to a new sustainable model not depending on oil and characterized by a high level of resilience and connection among people. Faces of Change, a photographic and documentary exhibition of the faces of people already striving for a sustainable and ethical transformation of our society, focusing on the Biellese territory in particular. The exhibition includes some of the researches that Cittadellarte has invited STEALTH.unlimited to develop in the last few years, now become an essential part of the activities that Cittadellarte has dedicated to these issues intensifying a programme of study and research, intervention, on-site experimentations and of sharing with the rest of the world. The artists taking part in the exhibition have decided to pledge their works to support UNIDEE, not only as mentors for future activities, but also making themselves available to guarantee grants to participate in the programme itself. Such a commitment is carried out through 500per1000, whose works are entrusted to Cittadellarte to be displayed and offered for sale to the public, half of the selling price (500 per 1000, or 50%) is then conferred to the artist who realized the work, while the other half is destined to a fund which covers the costs of participating in the programme. The experiences present in the exhibition illustrate experimental pedagogical programmes in which thought and critique have become a single form of direct action on reality. Through methodologies of radical pedagogy, militant research and institutional activism, the idea of classroom is redefined as a “democratic space”. The room turns into a laboratory in which to rewrite the social contract. The Bank of the Migrating Germplasm is a collection of migrating seeds present on the national territory. The aim of this living archive is the heritage of an asset of biodiversity that is generally perceived in negative terms both by ordinary people and in “agro-culinary politics”, in contrast with the ancient varieties presumed “ours”. FLICKR ALBUM "ARTE AL CENTRO 2016"